1.20.010 State Flag. 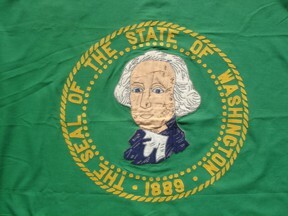 The official flag of the state of Washington shall be of dark green silk or bunting and shall bear in its center a reproduction of the seal of the state of Washington embroidered, printed, painted or stamped thereon. The edges of the flag may, or may not, be fringed. If a fringe is used the same shall be of gold or yellow color of the same shade as the seal. The dimensions of the flag may vary. 1.20.080 State Seal. The seal of the state of Washington shall be, a seal encircled with the words: "The Seal of the State of Washington," with the vignette of General George Washington as the central figure, and beneath the vignette the figures "1889" and shall be composed as appears in the illustration. The dark green version is presented as a piece of historical information. [Many years ago] I wrote all of the Secretaries of State in each US state asking them for information on their specific state flags. The State of Washington sent me a very handsome specification sheet, richly printed on some kind of heavy stock glossy paper. 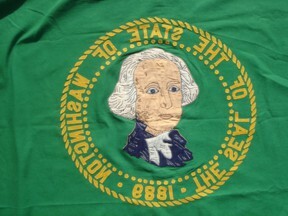 On the front was an illustration of Washington's flag maybe 12 inches wide. On the back was all the pertinent information about the flag, much like what can be found at the http://www.secstate.wa.gov/flag. My spec sheet had been put together in 1969. The flag on that spec sheet is very dark and is perhaps even darker than the 0-51-0 color that I have illustrated here. When I lived in Clarkston, Washington, I saw one dark green sample of Washington's flag hanging in the community center in Asotin, Washington, just down below Clarkston. It was the first sighting of only 2 dark green samples that I have seen. So, it leaves me wondering if at one time Washington's flag was actually darker or if there was an attempt to darken it that never really went anywhere. Washington State's flag is, by my understanding, green because its nickname is the "Evergreen State". I recently acquired a fully sewn cotton flag of Washington State, in part because its appearance is so different from the flag I now encounter at stores. These two photos of the flag show the front and back/reverse. You can see the head is out of proportion to the shoulders, etc. (reminds me of a Bobblehead), and the area behind the George Washington depiction is just green instead of the light blue you see these days. Also, the perimeter of the seal is comprised of little yellow leaves arranged in a circle, and you'll see that the flag does not read correctly on the reverse - someone actually went to the effort to applique numbers and letters backwards. An interesting variant, I would say. The original Washington State flag differs from the one in use now. You can see it and read information here: www.ga.wa.gov/visitor/virtualtour/tour.html, but you should go further, because the exact address doesn't appear on the bar. The image only: www.ga.wa.gov/visitor/virtualtour/images/capitol/13.jpg. Unlike other state flags, this one is vertical, more like gonfalon. See also the page at www.ga.wa.gov/visitor/virtualtour/stateflag-article.pdf, a period article (circa 1915) about the state banner, and www.ga.wa.gov/visitor/virtualtour/stateflag-resolution.pdf, the state law about the flag. The Legislature adopted the Washington State flag in 1925 and revised it to its present design in 1967 (RCW 1.20.010). An official state seal must appear in the center of each side of the state flag. The seal may not have a serrated edge. Its size shall be selected in proportion to the size of the state flag. In all other instances, the ratio of the state seal diameter to the length of the flag shall be 1:3. The state military crest, which is the crest used in the coats of arms of units of the National Guard, as granted by the precursor organizations of what is now the Army Institute of Heraldry. The official Institute of Heraldry blazon is "A raven with wings endorsed issuing out of a ducal coronet all proper. [From the crest of George Washington.]" Local flag manufacturers sell this flag for almost double the price of most other state flags because the seal is stitched on both the obverse and reverse of the flag (so that the lettering reads correctly on both sides). This is something my reading up on flags in various books, plus the internet did not inform me about. It was something of a surprise.